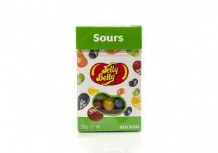 Jelly Belly Bean Boozled Spinner Gift Box Game 99g. 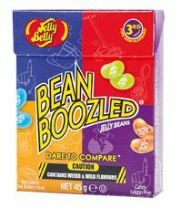 This 3rd edition jelly belly bean boozled box contains 10 popular flavours with 10 unappetizing flavoured beans - unfortunately they look the same - who will be the unlucky one! A whole new spin on playing with your food! If you thought the Beanboozled craze had abated think again! 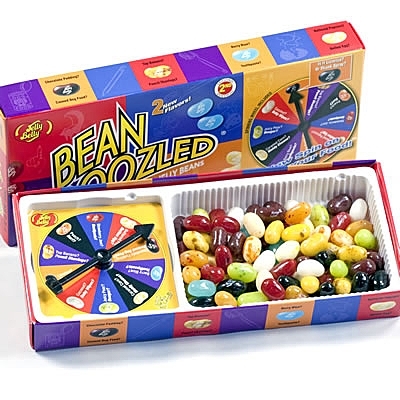 This 3nd Edition Beanboozled Spinner Game is a little like Russian Roulette - spin the wheel and let the game dictate the next colour bean someone has to eat. Only you won't know if it's yum or yuk! Fake out your family & friends-just don't get Beanboozled yourself! Ingredients: sugar, glucose syrup, modified cornstarch, peach puree concentrate, natural and artificial flavourings, strawberry juice concentrate, colours: E100, E102, E110, E129, E132, E133, E150d, E171; salt, pear juice concentrate, acidity regulators E330, E331; chocolate (sugar, chocolate liquor, cocoa butter, E322, soy lecithin, vanillin), glazing agents: E901, E903, E904; coconut, cocoa powder, tapioca dextrin.